Okra (Abelmoschus esculantus) is one of those vegetables folks just love to hate. Also known as gumbo, bamia, quingombo, and bhindi, this vegetable becomes a slimy mess if it isn't prepared properly. 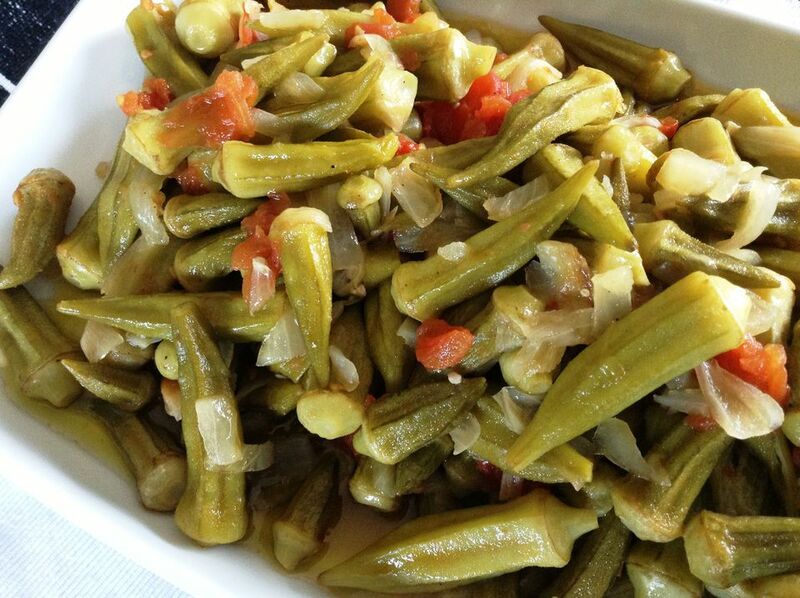 Okra is an acquired taste in Turkey, just as it is everywhere else in the world. If you're a fan of its earthy, woody taste like I am, you'll be sure to enjoy this simple Turkish recipe for 'zeytinyağlı ​bamya' (zay-TEEN'-yah-luh BAHM'-yah), or okra with olive oil. Like most other Turkish vegetable dishes cooked with olive oil, this recipe contains only a few simple ingredients, allowing the true flavor of the okra to shine through. If you plan to use fresh okra, make sure the pods are small, young and tender. The older and larger the pods, the tougher and slimier they can get. If you are using fresh okra, trim the rough stems from the ends of the pods and remove the thin membrane covering the stem end. Handle them gently as not to damage them. Rinse them several times in a wire strainer under ice cold water, turning them with your hands. Drain them and let them soak in one cup of vinegar for about 30 minutes. Wash them again to remove all the vinegar. Repeat this process once more. After your okra soaks in vinegar and is rinsed the second time, it's ready to use. If you're using frozen okra, it's ready to use right out of the bag. Peel the onion and coarsely chop it. Heat the two tablespoons of olive oil in a medium saucepan and fry the onions until tender and reduced. Add the fresh or frozen okra. Wash and peel your tomato. Dice it into small cubes and add it to the pan. Add the lemon juice, salt, pepper, and sugar and turn the mixture around gently with a large wooden spoon. Add the water, bring it to a boil, reduce the heat to low and cover. Let the okra simmer gently. The amount of liquid in the pan will increase as the vegetables release their own juice; you should simmer them until the okra are very tender and the liquid is almost gone. Test your okra a few times while cooking. If they are tender but there is still a lot of liquid, remove the lid so the liquid evaporates more quickly. When the okra is tender and the liquid is almost gone, turn off the heat and let the pan cool down to room temperature. Transfer the okra to your serving platter. Drizzle the 1/3 cup of olive oil over the top of the dish. You can serve the okra room temperature or cover and refrigerate it before serving.